Tiny house. Tiny house. Tiny house. I was enamored with this tiny house. Over the years, I’ve quietly explored tiny houses online in admiration, but it’s only this year that I’ve started doing so with a more serious purpose: I’m going to build one myself. Well, for one thing: why not tiny? There are so many reasons that a tiny house appeals to me. I’ve always been drawn to cozy spaces. As a kid, I loved reading in my closet with a flashlight and building tiny forts. More than that, I loved the feeling of home. I moved a lot as a kid (not to mention as an adult), so that feeling was sometimes elusive, many times interrupted. At the same time, it’s hard to imagine being tied to one place permanently. A tiny house is an elegant solution: I may move, but my home comes with me. And my home will contain just exactly what I need. Part of the process of planning and building a tiny house is figuring out just what that is. I know I have too much—and unnecessary—stuff. And it’s weighing me down. I want to have a lighter footprint. I want to get down to the essentials. Make room for other things in my physical and mental and emotional life. Like community. The tiny house community (so many amazing, enthusiastic people!) and the community I will build around my tiny house. This was a big topic of conversation that Dee Williams brought to the table at a workshop I attended (more on that below). I’m not going to have every single thing I need in my tiny house. Which is actually a beautiful thing. It means reaching out to other people, developing practical and meaningful two-way relationships. I also don’t want to live in the middle of nowhere all by myself. As I think about where to build and where to park my tiny house, I’m thinking about people and connection. I used to dream of a big house with a big library—a big desk surrounded by shelves upon shelves of books, a ladder to reach them all. Now I dream of a tiny reading nook with a small bookshelf and many fruitful trips to the library—and a ladder to reach my bed. 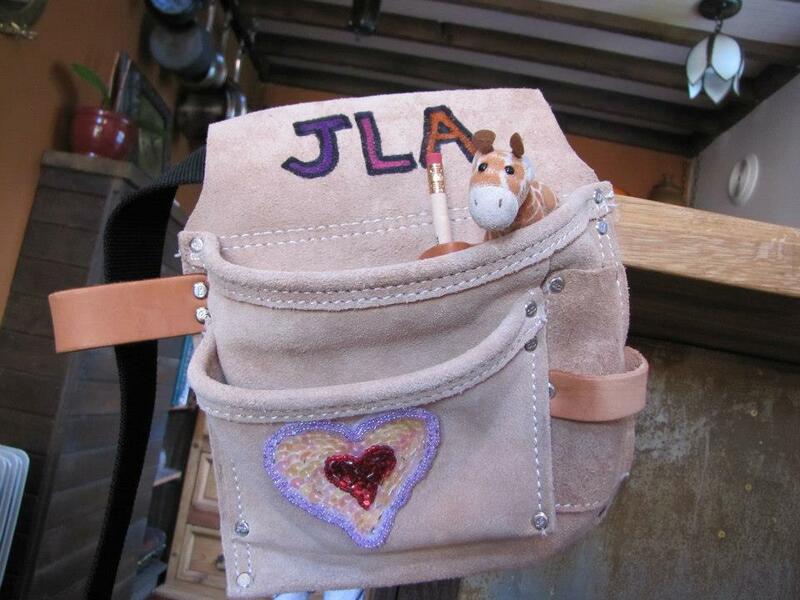 Tool belt—hand-decorated by a dear friend—that I shall use to build my tiny house! Began following all sorts of inspiring tiny house folks, like Lina Menard, who you can find over at thisisthelittlelife.com, and Chris and Malissa Tack of the Tiny Tack House, over at chrisandmalissa.com. They all presented at the PAD workshop I attended, and I can tell you that they (1) totally know their tiny house stuff, (2) are super friendly, and (3) are awesome people. Paid off my credit card debt, started a tiny house savings account (with no debit card to access it), and began direct depositing a bit from each paycheck into it. Registered and am currently taking a tiny house e-course with Tiny r[E]volution to explore even more of the details of building a tiny house, to keep the inspiration flowing, and connect with other folks who are into tiny houses. It’s going to take me a few years to save up enough money to build my tiny house, but that really works out perfectly because it gives me ample time to design and plan.